PURPLE HEART SERVICE FOUNDATION INC - PURPLE HEART FOUNDATION INC.
For over 50 years the Purple Heart Foundation has been supporting and honoring the sacrifice military veterans have made for our country. Last year alone, we helped over 19,000 veterans secure over $300 million dollars in VA benefits with our professionally trained VA Service Officers. Only with your continued support will we be able to provide desperately needed programs to assist veterans with new Service Dogs, Educational Scholarships, resources to help cope with Post Traumatic Stress, and necessary funding for research to heal those suffering with Traumatic Brain Injuries. Transitioning from the battlefield to the home front has never been more difficult, and every dollar donated makes a difference in the lives of our men and women in uniform.. yesterday, today and tomorrow. Stand with the Purple Heart Foundation and Honor the Sacrifice of Americas Veterans! 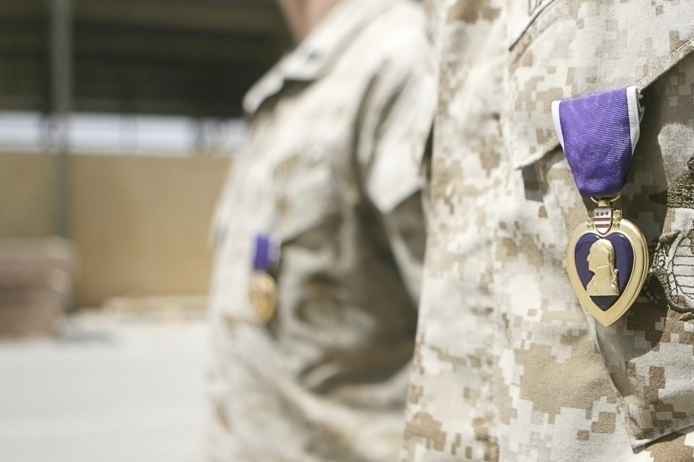 The Military Order of the Purple Heart is a congressionally-chartered veterans' organization whose members have been awarded the Purple Heart medal. The Order provides opportunities for engagement, camaraderie and support among Purple Heart recipients, but its mission is far larger than that, encompassing a multitude of programs that aid all veterans and their families. Chartered in 1957, the Purple Heart Foundation is the fundraising engine that supports the Military Order of the Purple Heart and it's National Service Officer Program, Ladies Auxiliary, Scholarship program, addressing Women's Veterans issues and Other Community Outreach programs. With additional grants and outreach programs, we lend support to organizations whose programs align with the Purple Heart's mission of honoring the sacrifice of Americas Veterans and their families.. In combat, warriors count on their comrades to have their backs. Yet when they return home, when they face new and daunting challenges – emotional, medical, financial and more – who is there for them? Who has their back then? The answer is the Purple Heart Foundation. The Purple Heart provides counseling and a wide range of programs and support services, along with unwavering advocacy on behalf of Americas Veteran Community. For more information please visit purpleheartfoundation.org. We are a Rock-N-Roll band with Veterans for Veterans (Copper Gypsy). We have written a song for veterans called "Sleep". All money from it we donate. Dana Loesch supports Purple Heart and she is a person of integrity - hence I am willing to support this organization to help all veterans. It is our duty to help ones in distress. Thank you all, from the bottom of my heart for your service and sacrifices under enemy fire. Thank you. From an old Squid. In memory of a sorely missed 'little brother', Sean Brightman. Fly high, my friend, fly high.